I think it would be say that since he’s NOT doing a free concert to show that his motivation is truly for supporting the LGBT people of Russia that his real intention is to pad his enormous pocketbook. Tghe only people Sir Elton is supporting is himself. But what can one expect from someone who could justify singing at homophobe Rush Limbaugh’s latest wedding and who performed repeatedly in South Africa during the height of the apartheid era. 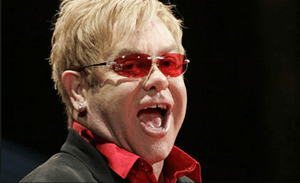 Elton John would sell his mother for a quid. Oh and by the way Elton, all your music has sucked since Captain Fantastic and the Brown Dirt Cowboys. Completely agree!! Not drinking Russian vodka is ok, i guess, but Elton not doing the concert would have actually meant something.